The Wedgwoodn't Project: 10 - The Wedgwoodn't Project is my shortlisted entry for the RSA Design Directions Ceramic Futures competition. 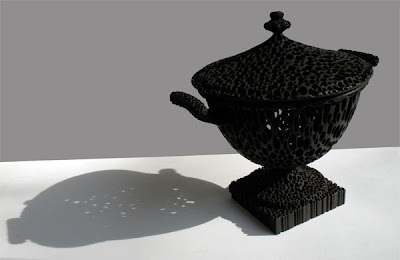 10 - The Wedgwoodn't Project is my shortlisted entry for the RSA Design Directions Ceramic Futures competition. The process of designing and making the piece was documented on this blog. To follow the project chronologically you need click on the November archive link and work backwards from there up to this entry. That's because last week's entry is superseded by this week's. Any thoughts or reactions to the project would be of interest to me. Yesterday I collected the completed Wedgwoodn't Tureeen with it's black 'Jasper' look-a-like ceramic coating. It has turned out just as I had hoped, but perhaps not expected. The project has been a technical challenge at all stages, but that was partly the idea as it was designed to test the materials and technology at each step. I feel deeply relieved to have got it to this stage! As soon as I got off the Eurostar I went straight to my meeting at the Wedgwood offices in Regent Street. Considering that I have taken liberties with Wedgwood history and heritage It was very well received.